Weekly prize x 50: limited edition McDonald’s Shake thumb drive! 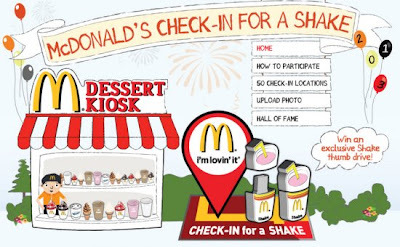 Visit any of 50 participating dessert kiosks and perform a Facebook check-in to the dessert kiosk location via Check-in For A Shake Mobile Site using your smart phone. Order a McDonald's Shake, take a snapshot of you enjoying the shake and submit the photo online. Visit McDonald's Malaysia website for more details. Peraduan Raya Fiesta Berganda Contest: Win Up to RM110,000 Duit Raya!